Nice photo and lovely studio! Thanks I am so lucky to have such a great studio, sadly it does not stay clean for long, sign of being busy right?!?! Absolutely excellent place to work. 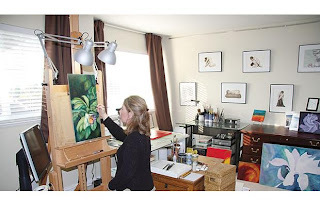 Thank you for sharing the photograph of your studio. Hi Tracey, oh what a great pic of you and your studio...so beautiful just like you and you work! Thats so me great publicity! best wishes to you for the upcoming show. wish we lived closer so I could attend..maybe one day soon I hope!